Is Oracle Doing what Sun Couldn't? I Can't Bring Myself To Think So. I'm staring at my mug with the image James Gosling created - Tux standing in front of Sun's gravestone, consoling Duke's loss. Sun left us too early... it was always an amazing playground of tech, giving us cool stuff like Jini and JMX. I was ill at ease with Oracle before their acquisition of Sun, and now I'm even more so. Still... I noticed that Oracle recently has done something that Sun hasn't been able to do. While Sun tried to govern Java with some sort of loose democracy known as the Java Community Process, it never was able to get consensus with the group and move forward. Perhaps Oracle's benevolent dictatorship is what the JCP needed - for now they have been able to get IBM to join forces with them and work on development of the OpenJDK. This is a pretty big deal, as Gosling notes. Not only does this collaboration accelerate open Java development but this also possibly reduces fragmentation since IBM will be scaling down their work on the Apache Harmony JVM. 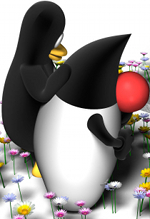 RedHat's IcedTea implementation is already married to the OpenJDK codebase, and without IBM's backing of Harmony the OpenJDK implementation quickly becomes a de facto standard. If Oracle can light a fire under the JCP and put significant engineering efforts around an Open Java development tookit... I dunno. Maybe things will turn out all right after all. I'm still pretty hesitant. My blogging juice is running low as of late. For the past several months I have been getting paid to blog... which is weird. Now the din of typing that has usually prefaced a post here ends up being posted elsewhere. It's awesome to get paid for something you love doing, but it does mean that free time is sparse. For example, it has taken me a good four days just to write this post. In the pauses between work and life I've been trying to look at DeskBlocks again. I still really like the idea: a physics sandbox that plays directly in your window manager and interacts with your desktop. I have a working version on SourceForge, but it requires a version of ODE and has a few bugs. I would like to ensure it plays nicely with multi-monitor setups as well, especially on dual displays with disparate resolutions. Of course my code has rusted in the months that it has gone untouched, and the algorithms I used to constrain the physics to two dimensions (instead of ODE's three) have become antiquated. 2D is a much more out-of-the-box affair now, and building with the newer library versions brings an instant segfault on object creation. Qt has matured over time as well, and I need to leverage the newer functionality of Qt 4.7. Not to mention my C++ brain has atrophied and need some exercise. I'm glad I wrote down most of my thoughts in a design journal - a discipline I've been doing for a few years now both at work and with personal projects. Old notes have saved me on a number of occasions, especially in scenarios like this where I'm picking up something after a long pause. I'm not sure how much progress I can make when my development time will only come in fits and starts, but I'm hopeful I can finally release something worth playing.